Long, long ago, in a galaxy pretty close to this one, we were so excited over Tron Legacy that we could barely sit still. Now that the movie has been out for a long time and we’ve seen it thirty or so times, we aren’t nearly as excited. 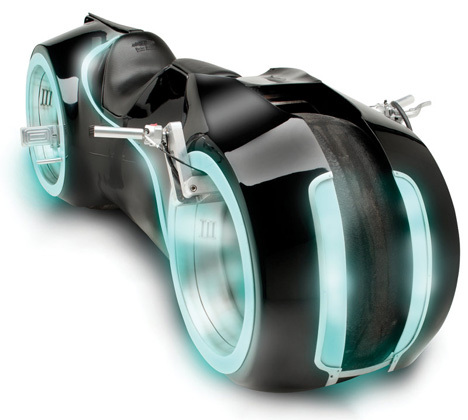 That is, we weren’t – until we realized that we can buy a real-life, working Light Cycle. 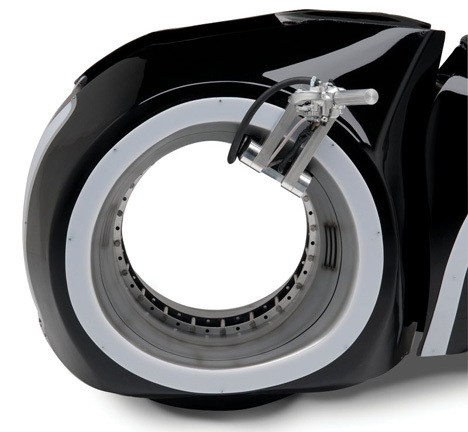 Insane gadget peddlers Hammacher Schlemmer are offering this truly beautiful specimen for a totally reasonable, not-spit-take-inducing $55,000. Riders kind of lie down on it, just like in the movie, while the foot pegs and handlebars control the functions just like on a normal motorcycle. Not like a normal motorcycle is the fact that this baby is meant just for looking cool, not for zooming around and racing your friends. It runs – but not fast.